As an ethnic minority the Nubians of Kenya are struggling for equal citizenship by asserting themselves as indigenous and autochthonous to Kibera, one of Nairobi’s most notorious slums. Having settled there after being brought by the British colonial authorities from Sudan as soldiers, this appears a peculiar claim to make. It is a claim that illuminates the hierarchical nature of Kenya’s ethnicised citizenship regime and the multi-faceted nature of citizenship itself. 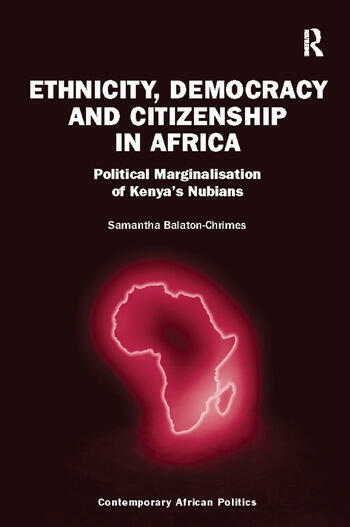 This book explores two kinds of citizenship deficits; those experienced by the Nubians in Kenya and, more centrally, those which represent the limits of citizenship theories. The author argues for an understanding of citizenship as made up of multiple component parts: status, rights and membership, which are often disaggregated through time, across geographic spaces and amongst different people. This departure from a unitary language of citizenship allows a novel analysis of the central role of ethnicity in the recognition of political membership and distribution of political goods in Kenya. Such an analysis generates important insights into the risks and possibilities of a relationship between ethnicity and democracy that is of broad, global relevance. Dr Samantha Balaton-Chrimes is a Lecturer in International Studies in the School of Humanities and Social Sciences at Deakin University, Melbourne, Australia. Sam’s research is interdisciplinary in nature, cutting across politics and political theory, development studies and anthropology. Her principal research interests are in the areas of democratic theory and practice in global perspective, with a focus on how minorities and marginalised groups can access, participate in, and transform democratic processes, and make effective use of their rights, particularly in relation to land.